We’d love your help. Let us know what’s wrong with this preview of The Little Old Lady Who Was Not Afraid of Anything by Linda Williams. Once upon a time, there was a little old lady who was not afraid of anything! But one autumn night, while walking in the woods, the little old lady heard...clomp, clomp, shake, shake, clap, clap. To ask other readers questions about The Little Old Lady Who Was Not Afraid of Anything, please sign up. is this book contemporary realistic fiction? This is a slightly watered down version of a story which I've heard or read before -- an old woman is followed home by one animated garment after another. In the tale I'm familiar with they gradually assemble into a full, presumably ghostly, figure; here they just sort of hang out together and wiggle. In the illustrations they are clearly disparate. Maybe this was intended to make the story less scary. If so it was successful. Possibly a nice Halloween read for less bold children who need a not- This is a slightly watered down version of a story which I've heard or read before -- an old woman is followed home by one animated garment after another. In the tale I'm familiar with they gradually assemble into a full, presumably ghostly, figure; here they just sort of hang out together and wiggle. In the illustrations they are clearly disparate. Maybe this was intended to make the story less scary. If so it was successful. Possibly a nice Halloween read for less bold children who need a not-too-tense tale with an unfazed protagonist. There is something to be said about being in touch with our inner child. We grow up, we experience the world, we toughen up, we become adults. Along the way, we outgrow our fears or we suppress them, but once in awhile, that fear we think is gone rears it ugly head and manifests in ways that scare us still. On those days, wouldn’t it be fun if we dug out our copy of The Little Old Lady Who Was Not Afraid of Anything, and be reminded that Boo! Goes both ways. In this classic tale, a little old There is something to be said about being in touch with our inner child. We grow up, we experience the world, we toughen up, we become adults. Along the way, we outgrow our fears or we suppress them, but once in awhile, that fear we think is gone rears it ugly head and manifests in ways that scare us still. On those days, wouldn’t it be fun if we dug out our copy of The Little Old Lady Who Was Not Afraid of Anything, and be reminded that Boo! Goes both ways. In this classic tale, a little old lady resolved not to be afraid of anything. As she walked deeper into the woods to collect herbs and whatnot that little old ladies collect while alone in a spooky forest full of shadowy apparitions that lurk at night, of course, she meets with stranger things. I shan’t tell you what they are except to whisper that they are discombobulating, spectral and you will most certainly quake in your boots. At once brave and terror-stricken, but never afraid, the little old lady confronted the moon lit visage and tell it to “F___ off”. Well, some polite form of that. She faced her fear straight-on and put it in its place, quite literally, where it is always within sight but never within reach. For some of us, that’s how it’ll always be. Call this fear anything - insecurity, anxiety, depression, despondence, anger, inertia or debilitation by any name. A fear we cannot vanquish entirely, but with resolution, can be kept at bay if we find within ourselves our own Little-Old-Lady-Who-Is-Not-Afraid-Of-Anything. Ah, yes, and also very suitable for children 1 year and up. Life’s lessons must be instilled from young! A lesson story presented in decent illustrations with cutesy graphics and catchy words that one can sing and boogie to (or less embarrassingly, played with a youtube video as accompaniment). A sure-fire hit for the uncle or aunt relegated to entertaining young relatives during the family Halloween (oh, let’s call it Harvest festival, for you non-pagans!) shindig. I reread this because I’d never written a review for it, even though I used to read it frequently with and to kids, because it’s one of 6 books for the October (theme: Autumn/Halloween) Picture Books Club at the Children's Books group. I was expecting that this would be a book I’d downgrade when reading it on my own, without enthusiastic kids hanging on every word and/or participating. But, it’s a delightful story. I love its cumulative nature, the sound effects, and the clever conclusion. It’s a I reread this because I’d never written a review for it, even though I used to read it frequently with and to kids, because it’s one of 6 books for the October (theme: Autumn/Halloween) Picture Books Club at the Children's Books group. But, it’s a delightful story. I love its cumulative nature, the sound effects, and the clever conclusion. It’s a perfect read aloud book, but independent readers will enjoy it too. I have read this book for theChildren's Book Club and it was alright. 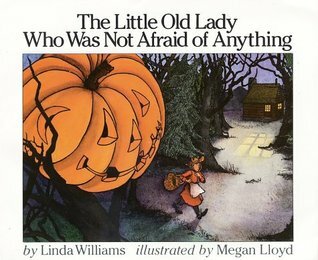 “The Little Old Lady Who Was Not Afraid of Anything” is a Halloween children’s book by Linda Williams along with illustrations by Megan Lloyd and it is about how a brave old lady goes out of her cottage to get some herbs, spices, nuts and seeds when she started to walk home, she meets a spooky set of clothes that follow her along the way! “The Little Old Lady Who Was Not Afraid of Anything” may have a brave protagonist and cut I have read this book for theChildren's Book Club and it was alright. 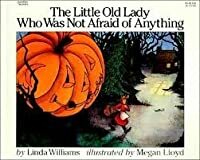 “The Little Old Lady Who Was Not Afraid of Anything” is a Halloween children’s book by Linda Williams along with illustrations by Megan Lloyd and it is about how a brave old lady goes out of her cottage to get some herbs, spices, nuts and seeds when she started to walk home, she meets a spooky set of clothes that follow her along the way! 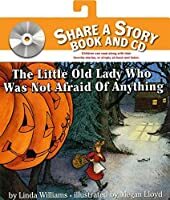 “The Little Old Lady Who Was Not Afraid of Anything” may have a brave protagonist and cute illustrations, but the story might not be creative enough for some children. Even though I gave this book a rating of three stars, there were some elements that I liked about the book. 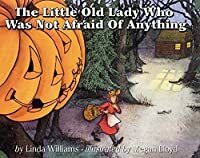 Linda Williams has done a great job at providing us a protagonist (an old lady) that does not fear anything no matter how scary the situation is and that was a trait that I really liked about the character since most children might actually learn how to be brave in scary situations from the old lady. Another aspect that I loved about this book was Megan Lloyd’s cute illustrations, especially of the image of the old lady herself. I loved the way that Megan Lloyd illustrated the old lady wearing a red dress with a white apron and a straw hat and black stockings with black shoes. I also loved the images of the clothes which include two brown shoes, one pair of green pants, one white shirt, two white gloves, one black hat and an orange pumpkin, chasing the old lady through the spooky forest. Another image that I really enjoyed was the way that the forest looked as it truly looks extremely spooky and the tree branches look like they are twisting themselves to grab the old lady. Now here is the reason why I gave this book a rating of three stars. I thought that the concept of a pack of magical clothes following an old lady was cute and not too scary for smaller children, however, the idea of just ordinary magical clothes following a little old lady seems to be lacking creativity and not creepy enough, but that’s just me. All in all, “The Little Old Lady Who Was Not Afraid of Anything” does have cute illustrations and a brave protagonist that everyone will adore a lot, however they bland storyline might not be every child’s cup of tea to read. 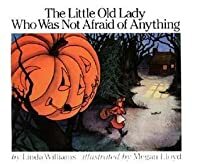 Impressive and enthralling at numerous levels, Linda Williams & Megan Lloyd created “The Little Old Lady Who Was Not Afraid Of Anything” in 1986. I am elated to have discovered it! It’s brevity does not diminish one iota of its layered, tickling impact. At first, one is tempted to attest Megan’s tremendously attractive illustrations to this book’s spark but Linda’s storytelling thrills me just as much. A nature woman like me, gathers herbs on foot at a distance from home. 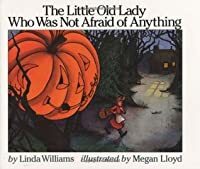 She has a contented Impressive and enthralling at numerous levels, Linda Williams & Megan Lloyd created “The Little Old Lady Who Was Not Afraid Of Anything” in 1986. I am elated to have discovered it! It’s brevity does not diminish one iota of its layered, tickling impact. At first, one is tempted to attest Megan’s tremendously attractive illustrations to this book’s spark but Linda’s storytelling thrills me just as much. A nature woman like me, gathers herbs on foot at a distance from home. She has a contented life but knows her woods can be spooky, so she hastens to avoid traversing them by night. This story is about a walk extending to nightfall. It is inanimate characters, as frightening in their aliveness as they are goofy in of themselves, that pop out to scare her. Boots, a shirt, pants, and even a jack-o-lantern should not be floating after her. The impossibility of these items giving chase to the woman has a built-in terror but of course, readers know their worst won’t become too scary. These goofy items manage to be one-hundred percent startling, on a night walk that she has to finish but she is bravely determined to shoo them away. I would have LOVED this story when I was little!!! All the sounds and the cumulative nature of the tale... it'd make a great read-aloud. (Plus, my favorite story when I was little was Dr. Seuss' tale of "The Pale Green Pants With Nobody Inside Them" and this features a pair of pants with nobody inside them!!!) I also like how the Little Old Lady solves her "problem" of the frightening things following her in a thoughtful, kindhearted and proactive way. A great Halloween read! My favorite Halloween book (not that it's about Halloween per se). Genuinely creepy, but won't freak out 3-year-olds, and a perfect ending. Sadly, this year T didn't want me to read it to him "because I can read it to myself". Still, it will be a good place holder while we head to RI for the weekend for some suburban trick-or-treating! My all-time favorite Halloween picture book! I read it every year for my Halloween storytime. Even older kids will participate with the CLOMP, CLOMP, CLAP, CLAP, etc. After reading the story, I like to go back to the beginning and show the picture of the old lady's yard. The kids love seeing what is in her neighbor's yard and hanging on the clothes line. My two daughters LOVE this book! There were plenty of places for me to make noises and voices which engage them and help them to interact with the story which is ideal for a 2.5 and 4 year old who is just starting to read herself. We have read it several times each day and I am sure will continue through the fall. My daughters will be anticipating taking it out again next year. This book is a great Halloween read for younger listeners because it is cumulative, super-involved (you get a whole body workout when you read this to your kids- you have to shake, shimmy and clap on every page!) and it sends a message that "scary" things aren't scary when you face them bravely. A must-read for ages 3-8. One dark and windy autumn night a brave little old lady was walking back to her house when she heard a clomping noise behind her. What could possibly be making that sound? She discovers an old pair of shoes has been following her, "Clomp, clomp." She turns to them and says, "I'm not afraid of you, " but she walks a little faster. As her journey continues she is confronted by other spooky things: a pair of pants, (wiggle, wiggle), a floating shirt (shake, shake), a top hat (nod, nod), a pair of w One dark and windy autumn night a brave little old lady was walking back to her house when she heard a clomping noise behind her. What could possibly be making that sound? She discovers an old pair of shoes has been following her, "Clomp, clomp." She turns to them and says, "I'm not afraid of you, " but she walks a little faster. As her journey continues she is confronted by other spooky things: a pair of pants, (wiggle, wiggle), a floating shirt (shake, shake), a top hat (nod, nod), a pair of white gloves (clap, clap), and finally a pumpkin head (boo, boo). She turns to each one and loudly declares she is not afraid but each time she steps up her pace to get back to her home little faster. Once inside she closes the door and collapses in her rocking chair and rocks and rocks so thankful to have made it home and to safety. The next morning she wakes up to a great surprise outside her window. I loved this book. This little old woman inspires you to face your fears, to keep on trucking and never, ever give up. I love how the suspense builds up on each page and invites the reader to accompany her on her frightening walk home. The illustrations are colourful, expressive and detailed, which I liked a lot. I highly recommend this book to be added to your Hallowe'en collection. I gave this story 5 stars! A little old lady is walking in the woods and suddenly followed by shoes, shirts, pants and a pumpkin. This is story that would work well for a younger child who likes to act out the parts of a story. There is plenty of clomping, wiggling, shaking, clapping and nodding with one BOO at the end. Nice rhymes for early readers who can easily pick up the repetitive pieces and join in. Such an adorable tiny story of Halloween!! I read The Little Old Lady Who Was Not Scared of Anything to Mrs.Steidman's 1st and 2nd grade class for Halloween Safety. The students acted out the actions in the book with the High Schoolers and it kept them involved in the book. The 1st and 2nd graders enjoyed the book. They said they thought the Lady was brave because she walked through the woods alone. They also said she was nice because she helped the spooky objects become a scarecrow. Overall, the students had a great time with the highschool students and enjoyed their action filled story. A brave old lady walks through the forest and comes across group's of clothes. Along the path she comes along a pair of boots, a pair of pants, a shirt, a pair of gloves, a top hat, and a very scary pumpkin head. She tells them she is not scared of them and returns to her cottage. She then gets a knock on her door from all the pieces of clothing trying to scare her again. They grow upset since they can't scare her. She gives them an idea. In the morning when she wakes up, she finds a very scary scarecrow. The little old lady showed bravery and compassion in this story. She was adventurous and went into a forest and she was a little scared when she met a met the clothing along the path but was ambitious enough to keep going. She was determined not to be afraid. However, when the scary pumpkin head came up she ran away to her cottage. The little old lady did not give up on herself thoughts because when the clothing came back she braved up her fears and gave them an idea. Not only show her growth in confidence, but her kindness and wittiness. The little old lady grew her character a lot over the story. Love, love, love this book! This will be our third fall reading it a billion times. Incorporates sound with the story. Kids will love to clap, stomp and shake as you read. It is scary in a silly way! I appreciate this book, as I think it was the first book a librarian ever read aloud to me, complete with goofy facial expressions and scary sound effects on Halloween. She has since passed on. Fond memories. Fun story to read with kids, they can act out the actions and get silly! This is the best not-so-spooky Halloween book for the littles! Such a fun story to read. and reread. Over and over lol. Nothing is as fun to a toddler as repetitive actions and clapping noises. My almost 3 yr old grandson loves this story! He remembers all the sounds the garments etc. make so I leave that reading up to him. Text to the world connection : Related to the theme of the month Halloween fall. Cute little story beautiful colors well illustrated. Great for math concepts. Repeating vocabulary and language. This can be also added too dramatic play as props and allow the students to repeat the story. Now this is a seasonal hit. My kids loved it, I loved it, and I'll be buying a copy for my classroom. It wasn't scary - only slightly creepy. It had repeating lines, which kids love no matter their age. It has a strong rhythm, which almost always pushes a book into the Can't Miss category. - perfect for creating rhythm and mo Now this is a seasonal hit. My kids loved it, I loved it, and I'll be buying a copy for my classroom. It wasn't scary - only slightly creepy. It had repeating lines, which kids love no matter their age. It has a strong rhythm, which almost always pushes a book into the Can't Miss category. Also published as Linda D. Williams.